Before Dean and Christie had met, God had placed a call on them to serve Him through mission work. 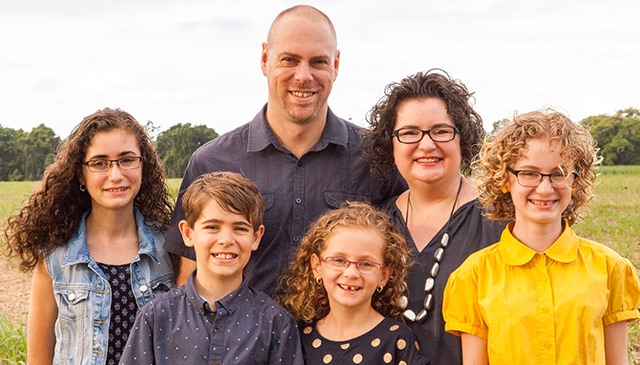 Christie had grown up on the mission field in Indonesia and felt strongly called to some form of mission service, while Dean felt called to use his chosen occupation as a pilot, to serve The Lord. Dean and Christie commenced their journey with MAF, in Arnhem Land during 1999, as a young couple. During their time in Arnhem Land their family grew with the arrival of their 4 children, Emily, Bianca, Nick and Kira. Whilst with MAF Dean has been a pilot, Operations Manager and Assistant General Manager. Christie has also had many different roles involving tutoring, hospitality and working as a Teacher’s Aide in a classroom situation. At the end of 2015 the Giles family relocated from Arnhem land to Cairns where MAF has a regional support office. Dean now works in the area of Operations Support for many MAF programmes around the world and Christie is working with children who have special needs at a Christian School in Cairns. Be strong and steady, always enthusiastic about the Lord's work, for you know that nothing you do for the Lord is ever useless.